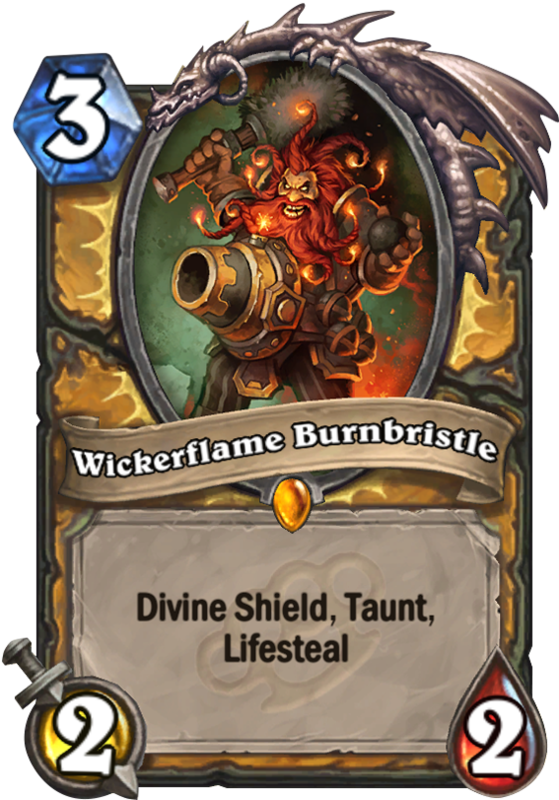 Wickerflame Burnbristle is a 3 Mana Cost Legendary Paladin Minion card from the Mean Streets of Gadgetzan set! 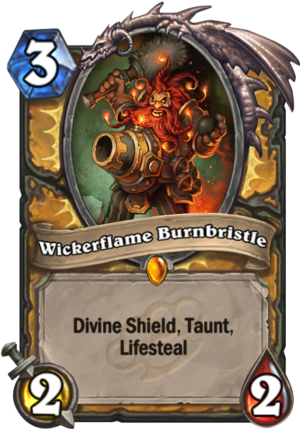 Card Change (8/8/17): Wickerflame Burnbristle read: “Taunt. Divine Shield. Damage dealt by this minion also heals your hero.” and now reads: “Taunt, Divine Shield, Lifesteal“. 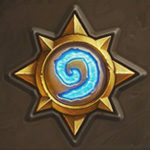 The change was made due to the addition of the Lifesteal keyword being added in Knights of the Frozen Throne. I’ve been trying to build a Midrange Djinn Paladin for a period of time. Upon the release, this guy can get along with the deck really well. Even though I’m not working on hand-buff mechanic, but just a raw Wickerflame Burnbristle is enough to be a good annoying threat for my opponents. He is very sticky. Combine him with Redemption, very fun. You guys are forgetting the plus to creature in hand effects. I am sure there will be times he hits the board over curve and then you can buff. Enfases on BY, not TO this minion. So it heals your hero everytime it attacks, not anytime it’s attacked. So the wording is different, but is the effect at all different from Mistress of Pain? I don’t think playing a sub-par statted card is worth this okay ability. 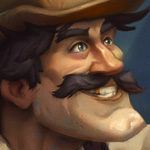 Paladin has plenty of healing options right now, so why does it need this? Even once standard rotates, it’ll still have Forbidden healing and Ivory Knight. I mean, think about it: It’s Annoy-o-Tron, which was already just an okay card, with 1 more attack for 1 more mana and an okay ability. Maybe that makes the card okay, but it seems way too weak of a play when Pally has so much elsle it can do. 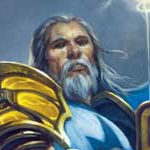 IMO, probably the worst Pally legend. I kinda agree. The stats seem waaaay too low. Mage just kills it with ping and Mana Wyrm or Arcane blast. Every Shaman threat just tears through it. Dragon Priest is gonna be able to just take it, assuming their 1 mana 2/3, 2 mana 2/4 and 3 mana 3/8 (stat wise anyway) won’t handle it on their own. It wants to be anti-aggro, but 2/2 is way too weak, even with divine shield. The only way I can see it being useful is as a giant theat + heal if you can get buffs on it. But it’s still probably not gonna be safe from a fireball, or a Soulfire and a 1 drop, much less a Hex. At least Annoy-O-Tron had the Mech tag so you could abuse that synergy back in the Naxx+GVG era of AggroStone. I think this card have good sinergies with other paladin cards in order to heal your hero a lot.